A much-changed Exiles earned the Dubai bragging rights as they beat Hurricanes 26-9 in the city derby on Friday night. 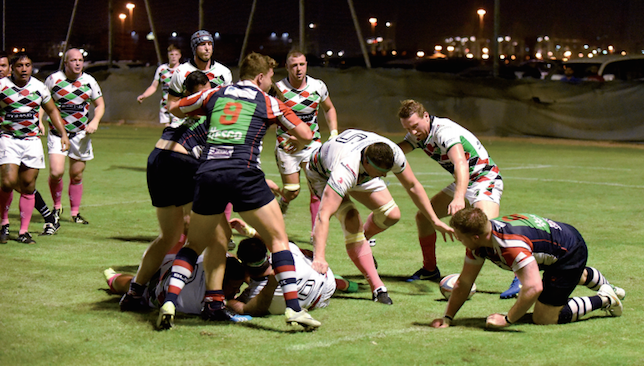 After a scrappy 14-5 triumph against Jebel Ali Dragons on opening night, new head coach Jacques Benade was happy to see a more fluid performance from his men against Canes, who had swept to a 32-14 win against Al Ain Amblers a week ago. Exiles built an early 9-0 lead at 7he Sevens thanks to three Durandt Gerber penalties. Canes reduced the gap to 9-6 with two penalties of their own before Exiles clicked into gear. Scrum-half Ed Armitage scored the game’s first try while centre Kenneth du Plessis, one of a whole host of new names Benade has introduced, also went over, with Gerber converting both and adding another penalty for a 16-point haul. Prior to the game Benade had labelled his side as underdogs, so he was delighted with his side’s performance. Benade is refusing to get carried away though and is sticking to his plan of wanting to win each game as it comes, which is probably a sensible idea as Exiles now face five away games on the bounce, starting with successive trips to Abu Dhabi where they face Saracens next week before facing Harlequins in two weeks’ time. 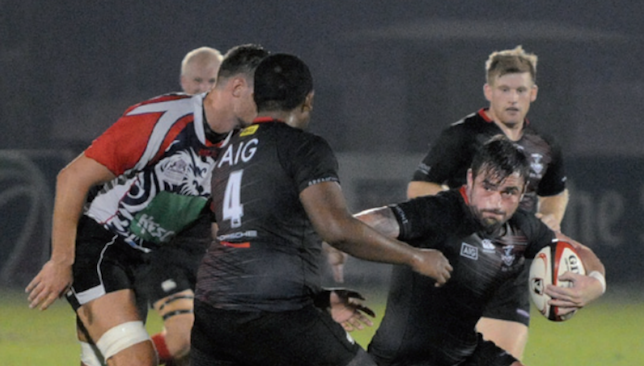 Mike McFarlane insists Abu Dhabi Harlequins have more gears to go through, which is a scary thought considering they torched Jebel Ali Dragons 35-7 on Friday night. On this form the new-look Quins could take some stopping, McFarlane’s men making it back-to-back wins in the UAE Premiership, scoring five tries in a game that became a romp in the second half. The comprehensive nature of victory had not looked likely in a poor first half, littered with handling errors from both teams. It was almost half an hour until the first points of the game were scored, Brian Geraghty stealing possession from a Dragons’ ruck and sprinting the short distance to touch down. The hosts were level before the break, Xander van der Westhuizen cutting a brilliant line to puncture Quins’ defence and go over. Quins responded immediately though and led 12-7 at half-time when a great break by full-back Alastair Johnson sent William Umu through. A storming run from Geraghty put replacement Matt Smith in at the corner six minutes into the second half and Dragons could probably see the writing on the wall when flanker Ben Blamaire was sin-binned for a kick to the head of Alastair Johnson which ended his night. Five minutes later and it was all over with the night’s best try. Quins turned the ball over inside their own 22 and winger Max Trimble showed fantastic feet and lightening pace to scorch 80 metres for a bonus point-clinching fourth try. Quins put the gloss on victory when Umu crashed through several tackles before offloading to debutant Augustin Arias, the Argentine prop touching down for his side’s fifth score. For McFarlane, victory capped a brilliant week, daughter Madison was born on Wednesday morning. Despite the comfortable win, McFarlane thinks there is more to come from his side. “At times we showed at our fluent best we can rip teams apart,” he said. “We played some clinical rugby and were relentless. We’ve just beaten Dragons with a bonus point and if anyone had offered us that at the start we’d take it. Dragons counterpart Bruce Pendrey took positives from the performance. “The Premiership is a fantastic competition and it’s a long road ahead with a lot of games. We’ll be playing until March or April so we’re building and strengthening the squad,” he said. Tickets for this year's Emirates Airline Dubai Rugby Sevens tournament have now gone on sale. Over 100,000 fans and 4,000 players are expected at the action-packed rugby festival which will take place on 3-5 December at the Sevens Stadium. Now in its 46th year, the popular three-day annual rugby event will attract the world’s best players as excitement for the Rio Olympic Games continues which will see Sevens being contested for the very first time. An array of top class international fifteens players will participate in this year’s tournament in a bid to realise their Olympic dream in 2016. Tickets for the festival can be purchased online or at selected Costa, MMI, Go Sport and dnata outlets, Bidi Bondi, The Sevens Stadium and Park n Shop.